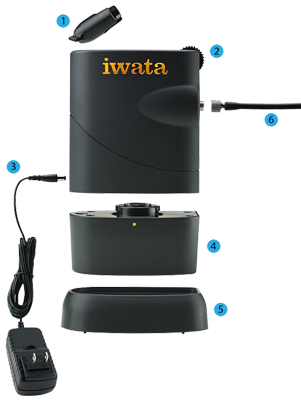 The Iwata Freestyle Air Compressor is sleek, simple and smart. Its unique curved design fits right in your hand. It has a 3 speed adjustment which cleverly lights up indicating the pressure settings (Low pressure/Red Light, Medium pressure/Yellow Light, High pressure/Green Light). It is best in class for portability and power. 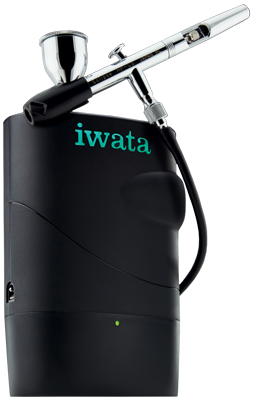 The compressor includes an AC power adapter with international plugs, making it perfect for domestic and international use/travel. It works as a plug in unit without the battery but the battery can be charged either on or off the unit. 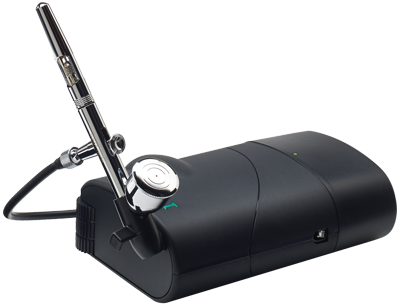 The machine can be used upright or laid flat and includes a non-skid, anti-vibration base. The fact that this is battery powered makes this compressor the ultimate necessity no matter where you are traveling. With Iwata you’re going places! Duty cycle: 45 mins (5 x 9 mins) continuous use. Please allow the motor to rest for at least 20 minutes after each cycle of continuous use. This compressor will automatically shut-off after 9 minutes of continuous use to remove the risk of accidentally leaving it turned on due to its quiet motor. 9 minutes is not the duty cycle and it may be turned on for 9 minutes for 45 minutes continuous use, before having to allow a cool down period. 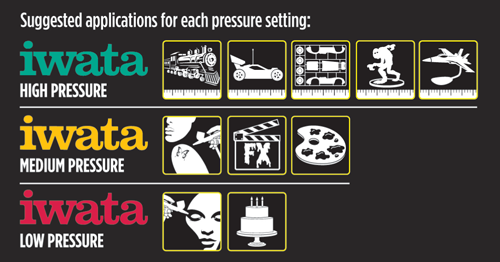 Deciding which pressure setting to use will depend upon the combinations of application, viscosity of liquid medium being sprayed and the model of airbrush. Test all 3 speeds to determine which will work best for your spray session.